Up to a heavy and slow morning – my cold raging, Michael's sciatica screaming, and a time out taken for conversations that needed to happen. The kind that percolate in your subconscious for awhile, and then the thoughts gel to the point that they need to come out, and come out now. Once that was over, we headed out onto Rt 20 again, past innumerable small towns – visible first by a looming grain elevator – and once in the town, you were back out of it again in about a ¼ mile, and back to paralleling the ever-present train tracks and cornfields. 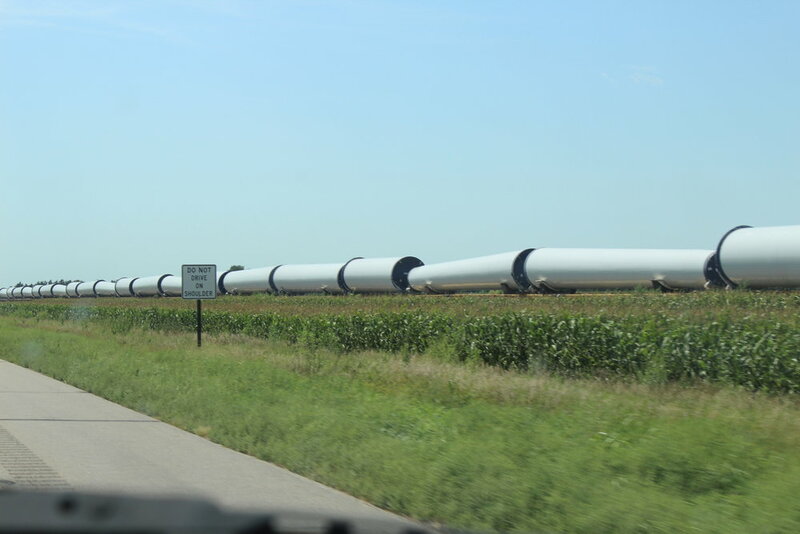 The freights appeared to be carrying mostly coal and ethanol (though we did see one with what appeared to be windmill tower parts), and they were somehow reassuring company in the long, straight, hot stretches. It topped out at 95° that day, but thankfully the camper never became too sweltering for the cats. After a not-so-quick stop at a giant Cabelas that suddenly loomed in place of the expected grain-elevator (Fynn is currently obsessed with survival gear), we wandered into another city park campground in Gothenburg. This was the subject of much discussion, as there have been various ideas floated as to having a truck bed cap, or cover, or some such thing to protect the stuff we have in there. One idea discussed was using an upside down aluminum boat, with it's prow extending up over the cab, and the back portion joining some sidewalls built up from the truck bed. I did my best to stay out of the fray, my skepticism coming in waves that threatened to swamp the whole thing before anyone even looked at the boat's price tag. Gothenburg's claim to fame is “The West's Original Pony Express Station” – a nice vague title, and one taken lightly by our only neighbors at the campground, Jim and Lanyin, who turned out to be making their annual trek west via the Pony Express route. Jim declared there to be as many Pony Express stories as there were stations, and we weren't in any position to argue. We met them while they were walking their cat around the park … sans a leash … the first folks we'd encountered who had a cat who would go for walks like ours sometimes will. It was nice to have another quiet campground, one of the benefits of traveling after the summer crowds are gone. categories adventuring, campground stories, Westward Ho!